I have a profound love and respect for the natural world, and I strive to honour the earth as I journey through life. When I started painting, I was fresh from a path of regimented academia. My head was full of data, and my environmental ethics and values were pronounced. All the new knowledge I had acquired felt suffocating, and I was angry to learn that we really were reaping the earth at an astronomical rate. Consequently, my art was based on delivering some form of environmental message. My art today is still rooted with the same passion, but I've embraced a softer approach of honouring nature and her sacredness rather than trying to dictate her suffering. I started to share my love of wild space and wildlife, and I allowed her beauty to paint through me. This was well received, and it soon felt much more important to keep nature in peoples lives, and lead by example (earth friendly supplies and packaging, etc), than try to pound in my strong ethics and values. But I do miss the more complex narratives in my earlier works, because they provoked thought. “Cyclical” is one such piece. Ask yourself, what do you see in this painting? I backpacked to the tallest trees in the world. Sequoia sempervirens (California Redwoods). I walked, listened, sat, painted, slept, and cried with these great great grand mammas. I felt their heartbeat pulse through my soul, and I humbly recognized my minority in the shadow of their years. They literally towered my existence. They are so kind, and so gentle. When you sit with them, you return to your mother's womb. I came to them to know them, because they hold a greatness that is now rare in the world. There is very little old-growth forest left (96% of original old-growth coast redwoods have been logged). I find the shame of deforestation difficult to bear. Make the journey to old-growth forests. And continue to make the journey. Take your children. It's paramount that we value the importance of these forests, and understand what we are destroying. When you stand among old trees like this, you will know. You will know their significance, and you will know the value of primary forest and biodiversity. Your lungs and heart will tell you. These forests hold more knowledge, more life, and more value than we will ever be able to measure. I consider it a tremendous honour to be in their presence. They are forever worth protecting, and they will always be worth the journey. My Belugas painting was inspired by the Vancouver Aquarium belugas. I painted a significant portion of it live at a multi-day event, but it took me nearly a year to complete since I painted it layer after layer. Aurora and her calf Qila died at the end of 2016, and this ultimately inspirited this work of art. While these belugas were held in captivity, I have imagined them free in the open waters, and gifted them this experience of freedom through watercolour. Despite the tragedy that surrounds captivity, these cetaceans have been a part of my life since I was a little girl (Aurora especially), and most definitely inspired my academic interest in marine biology, and my love of marine mammals. It felt important to honour them. This website is hosted on green energy! Since the first day tamaraphillips.ca was registered in 2012, it has been hosted on GreenGeeks servers. GreenGeeks is 300% green, and powered by renewable wind energy! What does 300% mean? Servers need a constant energy source for a guaranteed uptime, therefore their data centres require a connection to the grid. To compensate for this, GreenGeeks pulls back renewable wind energy to the grid three times (3X) the value of their consumed grid energy. Essentially, they wipe out their carbon footprint, and they also negate the carbon footprint of two additional companies of the same size. In addition, they use energy efficient hardware in environmentally friendly data centres, making them a leader in eco-friendly web hosting. I recently had a beautiful experience backpacking along the Olympic Peninsula's Wilderness Coast. When we left our camp on the final day, two deer glided across the sand in front of us. A few years ago I experienced something similar on the raw coast of Haida Gwaii: deer were quite literally playing and dancing in the waves right next to us, on a shore we spent days hiking on. I call them Sea Deer. They have been almost enigmatic in presence. It's as if a thin veil has been lifted on this magical land, and for a moment you get a glimpse of the true divinity of the space, and the enchanted beings that inhabit it... a reward for your time spent out in the depths of wild. It's a tremendous gift to experience any wildlife. However, it is especially meaningful to be trusted enough that a wild animal will share space and joy with you. We are always guests in their kingdom. Walk gently. Did you know, I create my own high quality prints? I individually print, dry, cut, and package each one by hand myself. Making prints myself means that I control quality as well as visual representation, it also means I control production and can minimize energy and material use and waste. I believe in low consumption and long life artworks. I use archival ink and my printers and scanners are energy efficient and Energy Star certified. Please read more about my sustainable business practices on my Etsy shop's About section, or browse my print collection here. The Nēnē, or "Hawaiian Goose" (Branta sandvicensis), is the official bird of Hawaii. It is endemic to the islands, and it is the rarest goose in the world. I am very grateful to have shared space with these beautiful animals during my most recent Hawaiian wilderness adventures. My experiences with them paralleled the incredible star filled skies above. I believe they are woven from the same fabric of the universe. 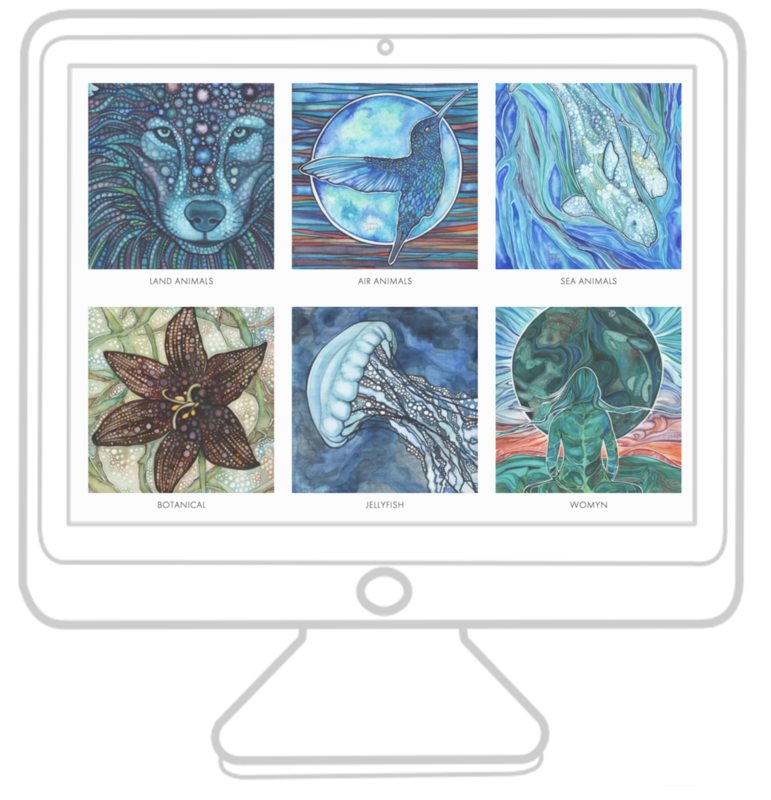 The stars in my painting actually represent the constellations I could see overhead when I was camping on the islands and sleeping next to these beautiful wild birds! I spend a considerable amount of time being in nature and experiencing her beauty and worth. I am an environmentalist at heart and I take great effort in minimizing my footprint on the earth. My cardboard backing, envelopes and business cards are earth friendly and made from 100% recycled post consumer and post industrial biodegradable paper waste. My info and packing sheets are printed on forest-free sugar paper (manufactured using the residue waste of sugar cane; elemental chlorine free), as well as EarthChoice paper which is Rainforest Alliance certified, Ecologo certified for reduced environmental impact, and FSC certified for global forest management standards. I consider my materials and their effects on the planet and people, before purchasing and using them. A few years ago I was swimming in Indonesia. As I dove into those pristine waters, I was witnessed by one of the most majestic of creatures, a giant sea turtle. With pure curiosity and longing, my hands silently wrapped around her perfectly sculpted shell as she gently pulled me through the thick of that pearled water. In this brief moment of hostage, her head turned and our eyes met as she looked back at me. She spoke to me through those wise eyes, and I understood: Her body was not meant for me, or my pleasure, but instead meant to swim free. I released her. With her gentleness she taught me a valuable lesson on freedom. 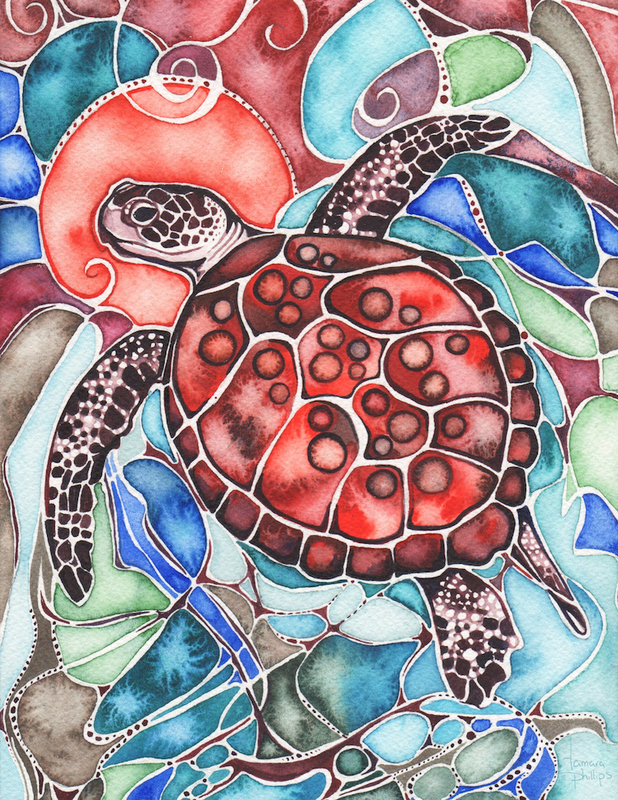 Oh wise ol' mamma turtle, I have not forgotten your forgiving look, and life lesson! When this turtle was a hatchling, her odds of surviving were not in her favour. Only 1 in 1,000-10,000 turtles make it to maturity. And she made it! I'm so thankful I get to celebrate her life through this painting. Sea turtle populations have been seriously reduced worldwide through a number of human threats: poaching, fishing gear entanglement, plastic, pollution, and climate change. I like to make my own paints from earth minerals! The process involves collecting soil, then separating, heating, grinding, and binding the minerals with tree sap. My Coloured Water (newsletter) issue Earth shares more of the process. Badger - Keeper of the Earth 12" x 9"
Badger. He is fearless. But he is disappearing. Taxidea taxus, the American Badger, is one of Canada's most endangered species. Recent studies indicate that our badger population (jeffersonii subspecies) has dropped to fewer than 300 individuals in my home province of British Columbia. The province of Ontario (jacksoni subspecies) has less than 200. Badgers are badass. But this isn't the only reason to love them. These animals play important roles in grassland ecosystems. As top-down predators, badgers help control ground squirrel, mice and vole populations, and influence a cascading food web. But humans and habitat loss, urban development, intensive agriculture and transportation corridors all have significant impact. There is hope. Recovery initiatives have been implemented and responsible farming practices are building an awesome alliance with these animals. But a population of 200 is incredibly low. This is not an isolated problem. Badgers face similar threats worldwide. Habitat destruction is the single most detrimental action we inflict on this planet. The diversity we have is special. Let's work together to keep things alive. The population of Sumatran tigers surviving in the wild today is estimated at only 400 individuals. Sadly, these numbers are quickly declining. This is heartbreaking. These animals are critically endangered, and as a result of poaching and habitat destruction, we are about to lose them forever. I painted this piece in honour of these magnificent creatures and in an effort to raise awareness after a 14 year old approached me asking if I could assist her in sharing this message by way of artwork and social media. Please read my Facebook post to learn about the wonderful story behind this painting. What would you like to see or learn about on the EARTHBLOG?